Sample letter formats and templates for your personal and business needs are provided on the page. We categorized letter templates into sections according to their categories. Browse your required category or search required letter in the search box. You can also browse for Formal Applications Templates here. We provide consultancy services and support to create official letter sample for business, personal and professional uses. Whatever the subject letter you need we are here to help you. Please write us in contact form. We create letters on demand according to needs of our website visitors and valued clients. You can browse below links for all kind of letter samples for business and professionals we have created for our clients are now part of our company profile. Soon we will be adding all type of legal letters for govt and judicial purposes with the help of senior lawyers and judges. Letters related to civil construction works – Letters to contractors for slow progress of work and of poor quality. Please make your query more clear. Please write your query with details detail. Please send to me guest apologize letter. Thanks for your Query. Please make it more clear. why guest is apologizing? OK.. I m work engineering coordinator at hotel.. All the time we get guest complain about Ac technician or anything else in side the room now on my side I need to send to the guest apologized letter…. Please help me. Thank you for providing the details. please visit this link. I hope you will find the needful. Tremendous effort by the maker! I really greatful to you people for doing the best. Can u please add the letter for store work ( i.e. all the letter releated to warehouse etc. 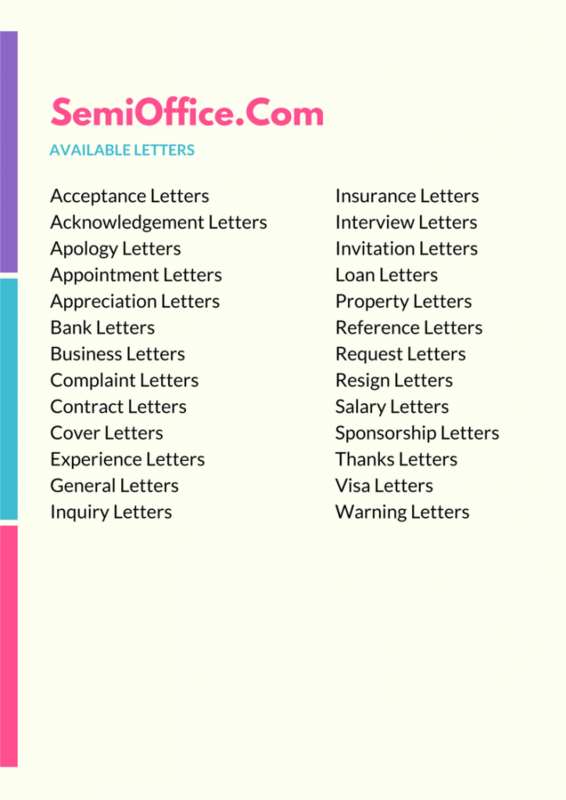 Its very useful letter applications. This is very useful website for all point of view and also very helpful. we r menufecturing arch.product of ss railing.modular LN key nock down fifing. i want appo.latter from architect. Congrats, you’ve solved our problem of letter writing. 100% work done. I would like to strongly thank all those who prepaired this useful work. I found it to be very beneficial to me.